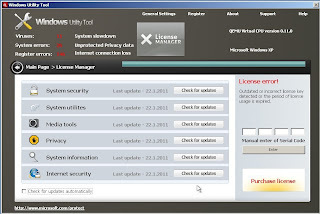 Windows Optimal Tool is a new fake security program, clone of Windows Utility Tool. It can not remove viruses and trojans, as well as protect your computer from possible infections. This parasite is created with one purpose, to force you to buy its full version. Windows Optimal Tool is promoted and distributed through the use of Microsoft Security Essentials Alert trojan. When the rogue is installed, it will register itself in the Windows registry to run automatically. Further, the program will begin a system scan and list a lot of trojans, viruses and other malicious programs. Of course, the scan and its results are a fake. The rogue uses the false scan results as method to trick you into purchase the full version of this program. Thus, ignore all that Windows Optimal Tool will show you and remove it as soon as possible. As you can see, Windows Optimal Tool is absolutely useless and what is more, even dangerous software. Most importantly, do not purchase it! Instead, please use the Windows Optimal Tool virus removal guide or the instructions below to remove this malware from your computer for free. Reboot your computer. When you will see a WindowsOptimalTool prompt, click OK and wait while it`s scanning your computer, Once the scan is complete click "OK, Open the license manager" button. Now you can close the rogue, Press ATL+F4 or "X" button at the top-right of Windows Optimal Tool. It will open a contents of ProgramData folder (Application Data for WINDOWS XP). Now look for randomly named files, e.g lklklka.exe or lklklka, and rename them. Reboot your computer.